In October I painted a couple of studies of the historic Palace of Fine Arts buildings built for the 1915 Panama-Pacific International Exposition, built just a few short years after the devastating 1906 San Francisco Great Earthquake and Fire. That exposition was instrumental as it introduced important art movements from around the world to American artists. Today, it’s not a traditional art museum, as you may expect, but houses the Exploritorium, one of my favorite museums in the city. It’s a museum “of science, art and human perception”, it continues it’s role as a place of all things “new” in the arts. The buildings have just finished a restoration, so the scaffolding that has been surrounding this dome are finally gone! I may paint here again this weekend, as there are lots of compositional opportunities and the weather is perfect. I especially like the later afternoon light, which is when this was painted. It illuminates the dome in about 1/3 light from across the lake. 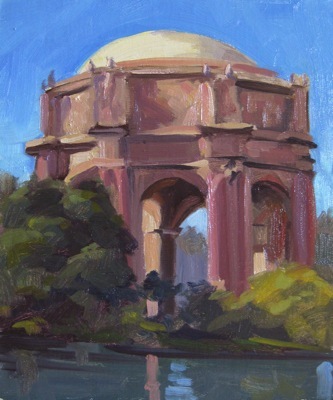 When painting structures, I think it’s important to capture them in partial light and shadow. Just as with the figure, this approach allows you to best convey form and structure. If the building from this angle where in full sun or shadow, I wouldn’t have been able to convey the shape and solidity of the structure. It’s for sale in my online store. Enjoy!